Setting a crowdfunding goal may sound like an easy and quick thing to do, but it's really worth spending some time noodling it. We read of so many crowdfunding campaigns raising millions of dollars as crowdfunding gets huge in 2015 that it's easy to say that we should set super high finance goals. The truth is there is a lot of complex psychology going on with your backers in setting a finance goal -- let's discuss. When your first backers come to your crowdfunding campaign, they're there to see your aspirations. A lot goes into this first impression: the quality of your crowdfunding video, choosing the right title for your campaign, etc. The dirty truth is that while crowdfunding democratizes fundraising, it isn't as easy as it looks. Most campaigns don't succeed and if they do, they're not raising huge amounts of money. Most campaign creators learn about crowdfunding from “success stories” in the media. But you need to realize that almost 62% of Kickstarter campaigns fail, and among those that succeed, the vast majority raises below $10,000 (source). Kickstarter campaigns are what's called all-or-nothing. If your campaign doesn't reach its goal, you pack up and walk away -- you get zero. Backers understand this dynamic, as well. Donors don't want to contribute to campaigns that might fail. So, you're going to want to create a high-enough goal that you want your backers to stretch themselves while also creating a realistic enough goal that you're going to succeed. Easier said than done, but that's why setting a smart funding target is important. 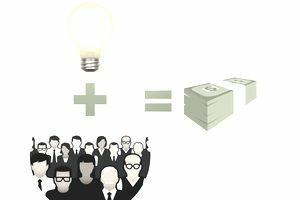 Crowdfunding provides a lot of benefits to businesses. It's a great way to gain visibility and press. It's an efficient way to raise funds. Crowdfunding is also a perfect way to market test new products. So, like every project in life, it's important to start by looking first at what the objective is with your crowdfunding campaign and construct your crowdfunding rewards with this goal in mind. How Much Do You Need to Crowdfund? There's a saying in venture capital that companies should raise as much money as they can when they don't need it because when they do need it, it's harder to raise money. The same can be said with crowdfunding, too. Here's how to run a crowdfunding campaign on a budget. Figure out how much money you need. Keep in mind that raising millions in the form of reward crowdfunding means that this isn't free money -- you'll have to deliver on your rewards. The more you raise, the more pressure on your to perform. How Much Do You Think You Can Crowdfund? If this is your first crowdfunding campaign and you don't have much of an online presence or identity, you may find it hard to get your backers' attention. On the other hand, if you have an email list, a lot of connections on social media, and a knack for marketing, it's possible you can raise bucketloads of cash. Keep in mind that while the barrier to begin crowdfunding is quite low (anyone can launch a campaign on Kickstarter), the barrier to doing it well is high. Consider engaging a marketing/PR agency to help you construct your products and campaigns -- the good ones can help you raise a lot of money. Be aware of the tension between setting a low-enough goal you can realistically hit and an aspirational goal to garner a lot of excitement behind your crowdfunding campaign. Good luck!